We are proud to offer the new Kia Optima in Odessa, Texas. This elegant midsize sedan is available with either a standard or hybrid engine and is one of the most popular Kia models nation wide. 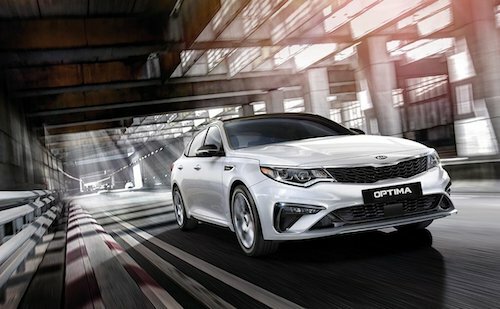 With comfortable seating for 5 adults, a multitude of safety features, an efficient combined 27 MPG for the gasoline model or 38 combined MPG for the hybrid model, it is not surprising that the Optima is the first choice of many Kia owners. Kelly Grimsley Kia has a wide array of Optima models in stock. Browse our new Kia inventory online to see MSRP, color options, trim levels, vehicle details and photos. If you are searching for something specific and we don’t have it in stock, we can usually find it for you. So let us know what you are looking for and we will do our best to get you behind the wheel of your dream car. We invite you to come test drive a new Kia Optima in Odessa,TX. Our friendly Kia dealers are on standby to answer your questions and help any way possible.